The Montana softball team, winner of seven of its last nine, will open Big Sky Conference play this weekend with a three-game series against North Dakota at Grizzly Softball Field. Montana (15-16) and North Dakota (12-18) will play a doubleheader starting at 1 p.m. on Saturday, then play a single game on Sunday, also at 1 p.m. The Grizzlies are in the heart of a 14-game home stand that began last week with the Grizzly Classic. Montana went 5-1 over three days, finishing 3-0 against Seattle, 2-1 against Maine. On Tuesday the Grizzlies split with Boise State, falling 4-3 in the opener despite being one pitch away from a 3-2 win, then rallying for a commanding 3-1 win in the second game behind a complete game from freshman Michaela Hood. Montana will be home next week as well, hosting Southern Utah, with a doubleheader on Friday, March 31, starting at 2:30 p.m., and a single game on Saturday, April 1, at 1 p.m.
With two of the Big Sky Conference’s top three pitchers in ERA throwing this weekend, fans making their way to Grizzly Softball Field should probably expect more of what was seen on Tuesday: low-scoring pitching matchups with a key hit here or there making all the difference. The dream scenario would be for North Dakota’s Kaylin VanDomelen, who leads the Big Sky in ERA (1.77) and strikeouts (89), to pitch game one on Saturday and again on Sunday and go up both times against Montana’s Michaela Hood, who ranks third in ERA (2.66). “I haven’t set our rotation yet, but if we go Hood in two games and they go VanDomelen twice, it would have the makings of a pitchers-dual-type setup,” said UM coach Jamie Pinkerton. VanDomelen is no surprise. She was good enough last season that she was voted first-team All-Big Sky Conference off the league’s last-place team. She’s kept it up this year, with the league’s only ERA below 2.0. She has 14 more strikeouts than any other Big Sky pitcher and has thrown eight complete games. She teams up with fellow junior Hannah Bergh to give North Dakota a pair of quality starters. Both are 6-7, with Bergh holding a 3.85 ERA. Both would have better records but the Fighting Hawks are hitting .222 as a team, the lowest batting average in the Big Sky. Montana is developing its own 1-2 punch, with Hood and Colleen Driscoll, who is 3-4 with a 3.20 ERA, which ranks sixth in the Big Sky. 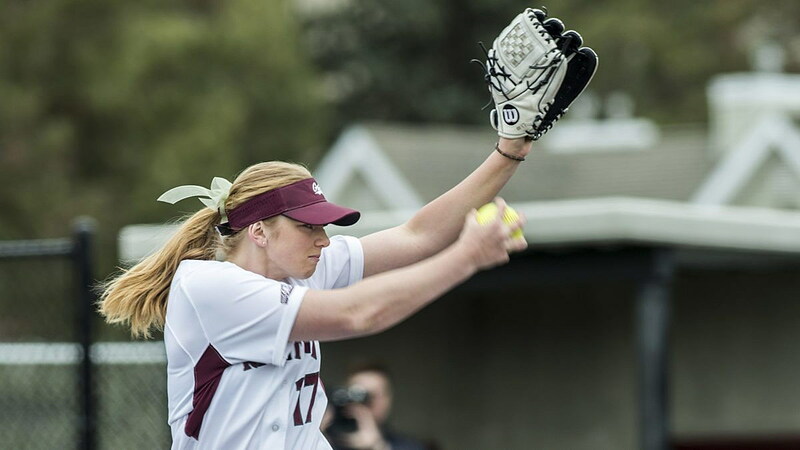 Maddy Stensby threw her first complete game of the season in Tuesday’s 4-3 loss to Boise State, and Sara Stephenson, second-team All-Big Sky last season, gave up one earned run over five innings of work in her last appearance, on Sunday against Seattle. “I would like to get to where we can go one starter each game (of a three-game series),” said Pinkerton, “then use our other pitchers at the back end of games. Both staffs rank in the top half of the Big Sky in ERA, with Montana (3.98) sitting third behind Sacramento State (3.33) and Weber State (3.90). North Dakota ranks fourth (4.15). At .268, Montana hasn’t approached the .326 the Grizzlies hit last season, but Montana enters league with six more wins than it had last year at this time because of its improved pitching. * It was confirmed this week that MaKenna McGill‘s season is over. The All-Big Sky Conference center fielder injured her knee making a catch on a ball at the fence in Friday’s 7-4 loss to Maine. In the team’s six games since McGill’s injury, Anne Mari Petrino, Kylie Hayton and Gabby Martinez have all batted leadoff at least once, with Alex Wardlow getting all the starts in center field. “We were holding out hope but expecting the worst. Now we know what we have to deal with, so we’ll move ahead,” said Pinkerton. * Montana and North Dakota have faced one common opponent this season: Boise State. The Fighting Hawks lost to the Broncos 6-3 two weeks ago at Loyola Marymount’s tournament in a battle of staff aces. North Dakota got to Boise State’s Christina Washington for two early runs and led 2-0 going into the fifth inning behind the pitching of VanDomelen, but the Broncos scored five in the fifth, all charged to VanDomelen. Washington, who pitched six innings, picked up the win in game one on Tuesday against Montana when her teammates scored a pair of two-out runs in the top of the seventh to help Boise State rally for a 4-3 win. Hood limited the Broncos to four hits in Montana’s 3-1 win in game two. * Montana is 6-0 against North Dakota. The Grizzlies swept the Fighting Hawks in a three-game series in Missoula in 2015, the Grizzlies’ first league sweep in program history, then repeated it last season in Grand Forks. Montana won the teams’ series opener last spring 5-4 in 12 innings. Both teams scored four runs in the second inning, then both put up 0s on the scoreboard until MaKenna McGill scored an unearned run in the top of the 12th. Colleen Driscoll pitched 9.1 innings of no-run relief for Montana, while VanDomelen went the distance for UND, facing 50 batters over 12 innings. Sara Stephenson pitched a complete-game shutout as Montana won game two 4-0. She also picked up the win in relief in game three, as the Grizzlies rallied back from a 7-3 deficit to win 9-7. * North Dakota was picked seventh out of eight teams in the preseason coaches’ poll. The Fighting Hawks went 17-37 last season, finishing last in the Big Sky with a 4-15 league mark. * Junior shortstop Delene Colburn picked up her second career Big Sky Player of the Week honor on Wednesday for her play last weekend at the Grizzly Classic. Colburn, from Auburn, Wash., batted .438 in Montana’s six games, with a three-run home run and an inside-the-park grand slam as part of her 12 runs batted in. * Freshman Michaela Hood went 3-0 at the tournament, with two wins as a starter, one in relief, with a 1.56 ERA, but she was edged out for Big Sky Pitcher of the Week honors by Sacramento State’s Taylor Tessier, who went 2-0 for the Hornets with a 1.40 ERA at Loyola Marymount’s tournament. Hood picked up the win in Montana’s second game on Tuesday against Boise State, allowing one run on four hits in seven innings. She has won her last five decisions since taking the loss in the Grizzlies’ 3-1 setback at Tulsa to improve to 6-2 and drop her ERA to 2.66. “The first few outings of your freshman year, you’re nervous and you fight some things sometimes,” said Pinkerton. “I think she’s comfortable with what she’s doing. She doesn’t seem to be thinking as much. Hood is tied for second in the Big Sky in wins (6) and ranks third in strikeouts (57) and opponent batting average (.239) and fourth in innings pitched (68.1). In her four appearances at home since last Friday, she has thrown three complete games in her three starts and pitched four innings of no-run relief in her lone appearance off the bench. She picked up the win in all four of her appearances while totaling 22 strikeouts and only five walks. “Her hits continue to stay under her innings pitched, which is very good, and her walks have trended downward,” said Pinkerton. “Whenever you can keep fewer runners on base than innings pitched, you have a chance to be successful. * Bethany Olea, who is batting .404, and Delene Colburn, who is hitting .393, have been Montana’s offensive leaders this season, and their names are all over the Big Sky statistics. Colburn ranks first in home runs (9), RBIs (30), total bases (72) and slugging percentage (.809), is tied for first in walks (20), ranks second in doubles (10) and is tied for third in hits (35) and runs (23). Her batting average ranks fifth. Olea’s batting average ranks fourth, and she is first in doubles (11) and runs (26), tied for first in walks (20), second in hits (38) and third in on-base percentage (.513). * Montana is 6-2 at home this season and has gone 15-3 at Grizzly Softball Field in its last 18 games. The Grizzlies are 29-13 at their home park in program history. * Three-dot notes: Delene Colburn has hit a home run in each of the last three games and in four of the last five. She had 10 home runs as a freshman, 12 last year and already has nine this season. … Colburn has reached base in 21 straight games. … Bethany Olea takes a 12-game hitting streak into this weekend’s games. The program record is 14, held by Ashlyn Lyons and Sydney Stites. … Madison Saacke has had four of her eight extra-base hits this season in the last week at home, with three doubles and a triple. … Sydney Stites went 0 for 7 against Boise State as her average dropped to .238. Last year the Big Sky Conference Freshman of the Year hit .383. But she is still driving in runs. Her 23 RBIs rank second in the Big Sky behind Colburn’s 30. * Big Sky preseason favorite Weber State, at 16-10-1, is the only league team that takes a winning record into conference play. The Wildcats travel to Sacramento State (10-12-1), picked second in the preseason poll, one spot ahead of the Grizzlies, this week for an important early-season series. In other league matchups, Northern Colorado plays at Southern Utah and Portland State travels to Idaho State.